The shopping centre, shopping mall, or shopping plaza is the modern adaptation of the historical market place where a group of merchants came together to sell their wares. The first shopping centre was The Country Club Plaza, founded by J C Nicholls Company, near Kansas City in 1922, and the first enclosed Shopping Centre was Southdale in Edina, near Minneapolis in 1956. In the 1980's the mega shopping centre was born. T K Retail Design Consultants apply their creative thinking and practical expertise in retail design projects for shopping centres all around the UK. Edinburgh is one of the key cities in which TK Retail Design Consultants operates. Edinburgh castle dominates the city, build on a volcano plug, and dates back to the 12th century. Edinburgh was also the birth place of Mary Queen of Scots. In addition to its beautiful historic buildings, Edinburgh is also renowned for its shopping centres, where thousands of visitors, foreign tourists and locals go to shop. The St James Shopping Centre in Edinburgh, hosts a large John Lewis store, yet most of the shops are fairy small, with a good selection of tea and coffee shops, and in house bakery restaurants. The Ommin Shopping Centre is a huge retail complex, very modern and trendy, with a distinctive metal sculpture of an adult and young giraffe. The Ommin shopping centre is very busy with its elegant shops, eating houses and wine bars. The retail centre also boasts a Gym, Spa, and cinema. The on going trend of bringing all forms of retail stores and leisure under one roof calls for the skills and experience of a retail design consultant such as TK Retail Design Consultants, where their involvement in a retail store development can dramatically affect the profitability of retailers and landlords alike. Glasgow is another great Scottish city of style and culture, founded in the 6th Century. In 1451 the University of Glasgow was built and Glasgow progressed to become a religious and academic city. Later, the de-silting of the river Clyde made it possible for bigger ships to access Glasgow, allowing industry then and retail to thrive in the city. Glasgow fell into decline in the 60s, 70s,and early 8os. However since then, Glasgow has enjoyed a renaissance being named The European City of Culture in 1990. With its quirky and inspiring buildings, Glasgow has become a shopping utopia, with its retail centres becoming a stylish place to meet with friends and shop in beautifully designed retail stores. TK Retail Design Consultants’ know how and retail store design skills have enabled them to optimise the design of several retail operations in shopping centres in and around Glasgow. 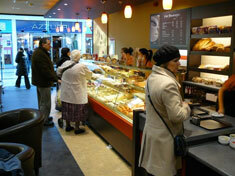 One of these retail design consultancy projects is Aulds in-house bakers in Clyde shopping centre in Glasgow. See Food Retail Design for details. Glasgow's Buchanan Galleries shopping centre, in Glasgow central, is a very modern and elegant retail centre. This retail centre has a good mix of high street shops and independent stores, making the shopping centre experience even more interesting. The retail centre's wide open spaces enable shoppers to move in and around the stores in comfort, on three levels. The food hall is on the top floor of Buchanan Galleries, with its array of coffee shops, tea houses, and eating areas. Plaza Centre West Shopping Centre in East Kilbride, Glasgow is a large retail centre, split into different retailing zones - Plaza, then Centre, and West. Classy up market stores combine with budget shops, providing a retailing mix that works. The Plaza Shopping Centre has two food halls, with tea shops, coffee shops, bakery restaurants, wine bars and pubs to choice from. There is also a library, ice rink and cinema to complement the retail facilities, enabling you to spend the whole day here if you wish. TK Retail Design Consultants are specialists in developing designs for major retail centres which are creative, attractive, practical and profitable. We have completed design assignments for some major UK retail centres such as Trafford Centre Manchester and White City retail centre, London. To see examples of TK Retail Designs consultancy projects please see Projects section where you will our assignments for jewellers, sports retail, art galleries and perfume retail. 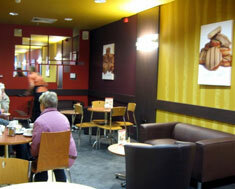 Please also see our specific pages for Coffee Shop Design, Food Retail Design and Sports Retail Design.